Första delen handlar om ett möte som våra forskare haft angående botemedel för FOP och det är häftigt att se att dom pratar om 1-3år respektive 3-5år. Tredje delen är en tacklista till alla som stödjer och för olika event som familjer hållit under 2011. IFOPA Support Families, Fund research, Find a Cure. We often use the word milestone to describe an important event, but it also denotes a significant point in development, a moment when exceptional progress is achieved. Hence, milestone seems a particularly appropriate way to portray the outcome of the informal two-day IFOPA-hosted workshop on Strategies for the Treatment of FOP held in mid-August in Philadelphia. Dr. Fred Kaplan, Co-Director of the FOP Research Lab stated that the focus of the event was “What is the biggest gap between what we know and what we need to know in order to achieve successful treatment and a cure for FOP? How do we get there in the short term (1-3 years) and in the long term (3-5 years)?”. 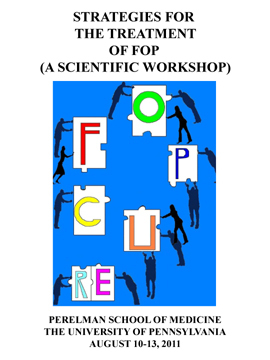 Dr. Kaplan wrote that the 27 scientists attending created “a war room atmosphereas they sat face-to-face around a large conference table and sketched the outlines for a final assault on a long-term enemy – FOP itself”. The ultimate product of the workshop was a list of treatment options prioritized for further basic research and preclinical development. For a community that has waited more than 25 years for scientists to even contemplate treatment options, the workshop was clearly a milestone. Beyond the tangible outcomes, one scientist spoke of “smelling the ozone in the room”, echoing Dr. Kaplan’s characterization of the think-tank atmosphere being “palpably exciting with a verve and tone unparalleled in the history of FOP research.” For a lay person such as myself these are heady words, especially from scientists who are customarily cautious when speaking about their work. The inescapable conclusion is that there is now a much higher level of optimism about the prospect for FOP treatments and a cure than has existed previously. Certainly, years of work remain to be done in the lab and at our family fundraisers where the critical life blood funding of the research is generated. But in the words of Ian Cali, we have gone “from hopeless to hopeful”. There is the unmistakable smell of ozone in the atmosphere! In closing, I’m pleased to note another milestone — the rebuilding of our IFOPA staff. On behalf of the IFOPA board and our association members, I welcome Jane Millen as Executive Director, Victoria Mandracken as Communications and Membership Manager and Denise Vietti as Accountant. Jane brings with her 25 years experience with the YMCA and similar organizations. Victoria provides an impressive range of communication and media skills for our organization. Victoria was most recently involved in public relations and communications for the non-profit Rebuilding Together Orlando. Denise has worked for several organizations in the Orlando, Tampa and Dallas areas. She has the MS degree in Accounting and Information Management and is currently preparing to sit for the CPA exam. The board is extremely pleased to have these talented professionals join our organization. We wish them a very warm welcome. The IFOPA has received a gift valued at $104,100 from the estate of the late Kevin R. James of South Australia. The gift is the third largest single gift ever received in the 23-year history of the IFOPA and was made in honor of FOP member Margherita Russo. 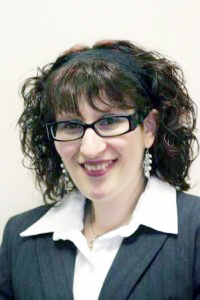 Ms. Russo is a Senior Paralegal for the Webster Lawyers law firm in Adelaide, South Australia. The estate gift is included in the Jeannie L. Peeper Heritage Roll of Honor, a legacy society established to recognize and honor those individuals and families who have included the IFOPA in their estate plans. Den nåt vi härom dagen och om man ska ha vin till så krävs det nog en köttbit. idag blir det kycklingen och i morgon fläskfilen. Fast jag är inte så förtjust i brässerad, så den blir nog stekt. Så skål och ha en go afton!